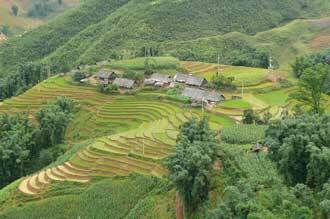 Hmong people like Chi, as well as Yao, Tày, Nung and other ethnic minority groups, live in Lào Cai province, a remote upland region in Northern Vietnam where I’ve been undertaking fieldwork with colleagues and graduate students for the past ten years. This time I’ve come to Vietnam and China for five months of my sabbatical and as one of my current projects I’m keen to listen to a number of Hmong elders recount their histories of the past and how their livelihoods have changed over time. A few days later my graduate student Christine Bonnin and I hop on the back of Hmong motorbike taxis and together with our young Hmong interpreter for the day, Be (who has taught herself spoken English from backpacker tourists visiting the area), head down the narrow valley road that snakes between rice terraces, hemp crops for making cloth, indigo patches (to dye the hemp), small family vegetable plots, and wooden Hmong houses. After we manage to run over a rather long snake en route and then trek by foot up the other side of the valley, we finally arrive at Be’s family house. Here we offer the pig fat and vegetables we’ve carried down from the local town market to Be’s father, Lue. Even though it’s just after Hmong New Year and Lue has recently slaughtered a pig in celebration, he’s happy to receive our gifts to boost his family’s food supplies. Our timing is good and Lue has time to sit and chat for a while since it’s not yet the season to plough the fields for the rice and corn crops. Today Lue is keen to talk about the days when they grew opium poppies in the valley. The lowland Vietnamese and Chinese nearby were enthusiastic customers for this crop that grew well in the upland areas on the Chinese border. While often marginalized as opium producers throughout Southeast Asia, it’s got to be remembered that ethnic minority groups like the Hmong were introduced to this crop by the Chinese and French colonialists (and British elsewhere in Southeast Asia) so it’s hardly the fault of the minority residents of these mountainous areas that the trade thrived there for many years and still does in some areas. While Lue is not aware of how the opium arrived in the area, he certainly remembers the trade negotiations between local Hmong growers and eager lowland customers. Also on Lue’s mind is the rice crop that his family will be planting shortly. He’s worried that the rice seeds that he’s just purchased from the state supplier are of poor quality and even if it’s a ‘high yield variety’ that the government has been trying to encourage ethnic minorities to plant for the past decade, Lue is very apprehensive that the crop will do well. Last year his cousin’s crop in another village nearby hardly germinated at all because the government seeds were not suitable for local climatic conditions. 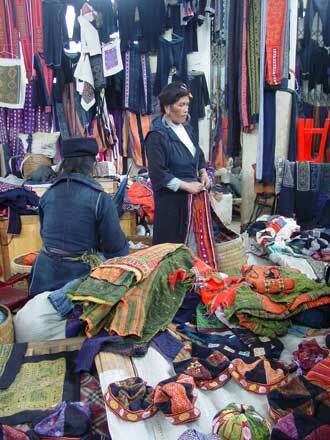 The next day back in the local market town I run into Chi – the new geographer – selling Hmong textiles in the market. 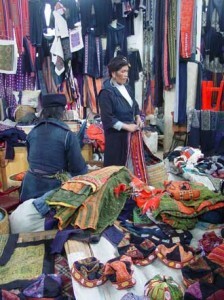 These textiles were originally those made by her family, but these days enterprising Hmong scour the countryside to gain supplies as the demand from tourists for ‘authentic cultural artefacts’ has grown, a topic that I’ve been researching for a number of years. Chi explains how a lot of these textiles are now coming over the border from China, brought across by both China-based and Vietnam-based Hmong. This factors into another aspect of my research in the highlands, analysing the small-scale, cross-border trade of ethnic minorities who navigate the political realities of an international border that cuts their historical homeland in two. 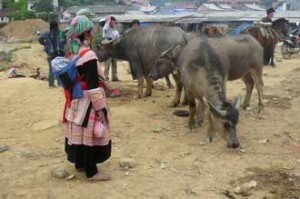 When I talk with ethnic minority people in Vietnam and China I find that their livelihood decisions are not always those that outsiders such as local government officials, aid agencies, or academics think they would or should be, be it about rice supply choices, trade preferences, border-crossing decisions, or local environmental judgements. But once you talk to and understand these ethnic minorities as individuals, households and communities, you find that their choices are often entirely rational based on their own, culturally rooted understandings of what success and failure, and ‘development’ are. The challenge is to get these voices heard. Sarah Turner is an Associate Professor in the Department of Geography at McGill University. Her research focuses on understanding how people who live ‘on the margins’, whether this be economically, politically, and/or culturally make a livelihood in Asia. This includes research on ethnic minority livelihoods in northern Vietnam and southwest China, as well as on street vendor survival tactics in Southeast Asian cities. She has recently co-edited the book: ‘Agrarian Angst and Rural Resistance in Contemporary Southeast Asia’ published by Routledge 2009.